Remember that kid in elementary school who was woefully uncoordinated, and didn’t know the rules to any of the games in gym? That was me. I was a computer kid — too busy tinkering with QBasic and making little movies and computer games to bother with anything athletic. Not much has changed in the two decades since. But somehow, with no experience and no knowledge of soccer, I’ve become the stadium announcer for a semi-pro soccer team. I live in the Hudson Valley, about 90 miles north of New York City. Though the region tends to fly under-the-radar, we’re in the middle of a cultural renaissance. Our food-and-drink scene is already legendary and continues to grow in influence; we’ve long been a haven for artists, writers, and musicians; our film industry is expanding rapidly. Best of all, we’re seeing a surge in the tech sector, spurred on by homegrown talent as well as an influx of tech folks from NYC who are “graduating” into upstate life. What we don’t have, though, is a solid local sports culture. In 2015, Foursquare founder Dennis Crowley founded Stockade FC, a fourth-division soccer club based out of the Hudson Valley city of Kingston. The plan was to bring the ethos of a tech startup to local soccer — information would be open-sourced, so other clubs could have an easier start, and the organization would be more tech-forward than most local sports teams. In the three years since then, Stockade has become a local institution. It’s won its regional conference, gained high-profile sponsors like Lyft and AT&T, and put D4 soccer on the map among people (like me) who previously didn’t know or care. In 2018, Stockade qualified for the US Open Cup (a big deal). Perhaps best of all, it’s inspired other small teams to do similar work, sparking a groundswell in grassroots soccer community. So how in the world did I get involved? In 2014, I decided to tag along on my extended family’s annual trip to Germany. I wanted a cultural primer so I’d know what I was getting myself into, and for Germany, that meant understanding soccer. So, I invested in a copy of FIFA 2014 and started playing short games so I’d learn the rules. At a local tech conference in 2015, I ran into Dennis Crowley, the founder of Foursquare and someone I knew from the Hudson Valley tech community. He mentioned that he was working on an idea for a community project that was going to be announced soon. “I’m always up to talk about local tech projects,” I said. “This one isn’t tech-related,” he said. Awesome! I felt supremely pumped — a massive surge of esprit de corps for the whole Hudson Valley. I decided to drive over to Kingston, a few towns over from my place, just to soak up some of the community spirit. I was sitting in a local coffee shop when my friend Kale walked in. Kale is an institution in the local tech community — he cofounded the Hudson Valley Tech Meetup as well as CatskillsConf, and generally knows about everything happening in the area. I waved him over, and he sat down across from me. I sit in the press box of the stadium with a microphone and watch the game. 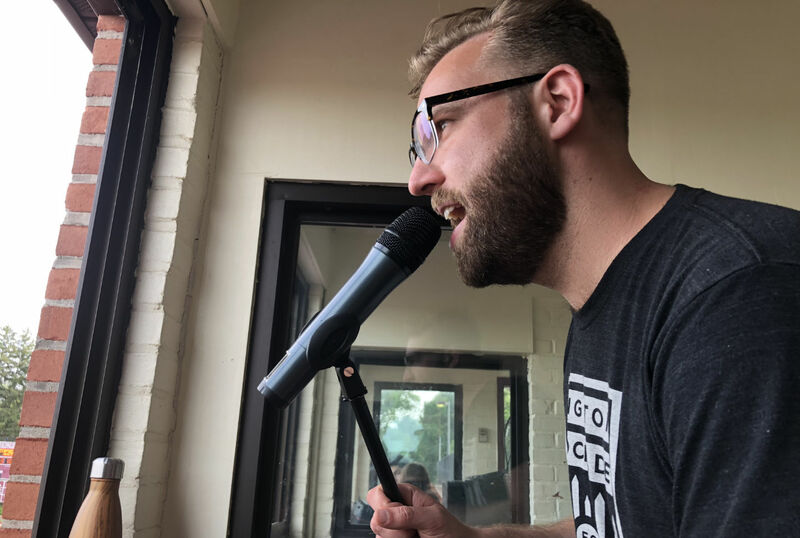 A definitely-not-staged picture of me announcing for Stockade FC. Thankfully, I don’t have to give any play-by-play commentary — that’s left for people with more knowledge and experience than I have, who narrate the livestream. 🎤 Make the opening announcements. I talk about our sponsors, make any announcements about the stadium or merch table, and give a quick intro for each team. 🇺🇸 Introduce the national anthem singer. #️⃣ Announce the starting 11 for each team. (With slightly more enthusiasm for the home team, of course). ⚽️ Say “goal” unenthusiastically when the other team scores. Shout “GOOOOOOALLLLLLLLLLL” with Steve Ballmer-like enthusiasm when Stockade scores. 🔁 Announce substitutions as they happen. Generally this involves seeing that a substitution is happening, squinting to see what number jerseys are being substituted, asking whoever else is in the booth with me if they can see the number, and then tapping on the window to get the attention of the commentators, who will hopefully hold up a sticky note with the numbers in case I missed it. 🎟 Make halftime announcements, such as announcing the match attendance or reminding people to participate in the day’s 50/50 raffle. ⏪ Make the end-of-game announcements, including final scores, goal recap, and information about the next match. 📜 I’ve written up a script template, making it easy to fill in info for each match. 🗒 I now write out sticky notes for each team, with the current lineup on the desk in front of me and the bench elsewhere. When a substitution is made, I can just swap out the appropriate sticky notes, making it easier to keep track of who’s where. 🔑 I keep a pronunciation guide for the players with trickier last names. 🐦 I keep Twitter open to the Stockade FC and Dutch Guard accounts (The Dutch Guard is our fan organization), to make sure I’m up-to-date on game-related chatter. Compared to the other volunteer roles, being the stadium announcer is thoroughly low-pressure. The trickiest part is keeping an eye on the player numbers and making sure that no goals or substitutions go unannounced; when a lot it happening at once, that can be a challenge, and it definitely helps to have someone else in the booth to confirm what just happened and update the sticky notes. Regardless, I think it’s the best job there — I get to watch the game from the press box, where it’s shady in the sun and sheltered in the rain. Best of all, it feels great to be involved with an organization that’s helping to build the community I love. The world is built by the the people who show up — this is a way for me to show up and help with something I’d otherwise lack the skillset to be involved with. You can follow Stockade FC on Twitter at @stockadefc, or find out more (and buy merch) at stockadefc.com. Newer Kit Older Farewell, Agrilyst. Hello, Dwell & Lightstock!